By the end of summer, there’s so much still on sale, and it’s hard to figure out if something is too summery to buy but it also feels too soon to be buying sweaters. My best bet? Spend your money on accessories–they can be the focal point of all the cute tops you already have, and if minimalist enough like Sophie Buhai’s jewelry, they’ll be just the thing to keep your winter wardrobe from being boring. Sophie Buhai is an LA-based designer, who creates everything from art, interior design pieces and jewelry to match her understated, chic aesthetic. Everything is timeless and has some weight to it–nothing too trendy, and nothing so minuscule that you’re spending hundreds of dollars on a barely there stud earring. So if you’ve been looking for an updated version of gold Sade hoops, these cowbell earrings are worth checking out. They’re a smaller hoop, but the chunky shape, gold vermeil and sculptural shape makes them feel so special that you could wear them every day and never get tired of them, and also stack them with other earrings you already have. 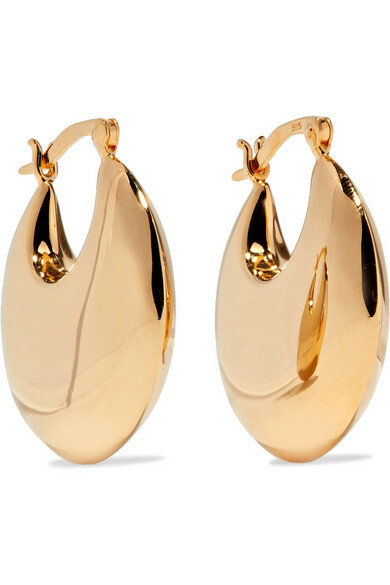 At just over $400, it’s a much better investment to buy these earrings than 2 designer tops on sale that you don’t really love.